Dudleya edulis, also called Lady Fingers or San Diego Dudleya, is an aptly named succulent plant given its graceful, silvery-green cylindrical leaves. The slender tapering “fingers” radiate out from a central point, adding an unusual texture as well as color to the garden landscape. This native plant is truly local for San Diego…you might see it sprouting from rocky outcroppings while hiking the back country. 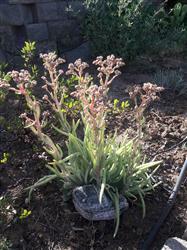 Dudleya edulis grows to be about 1’ high by 1’ wide, and is tolerant of cold down to 10 degrees Fahrenheight. In spring it blooms with small white flowers. As with most succulents, it appreciates a little shade during the hottest part of the day and well-draining soil. Supplemental water needs are minimal, as it stores water in its fleshy leaves. Tuck it into rock gardens to appreciate its evergreen appearance, and liven up a leafy garden with a native succulent!